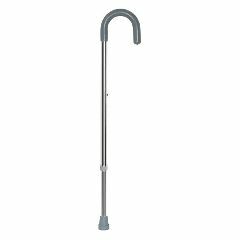 Smaller than standard canes with a vinyl grip designed for user comfort and to accommodate those with a smaller hand. Simple design with a chrome finish and a locking ring to prevent rattling. Easy-to-use, single push button adjusts height from 29-3/4 to 38-3/4 inches. Not made with natural rubber latex.